Winner of the Boys’ Singles title at the 2014 ITTF World Cadet Challenge in the Caribbean island of Barbados; just over four years later, on Wednesday 7th November, Korea Republic’s Hwang Minha emerged the player to cause the biggest upset in the third round preliminary round of the Men’s Singles event at the Seamaster 2018 ITTF World Tour Platinum Liebherr Austrian Open in Linz. Now 19 years old, listed at no.210 on the Men’s World Rankings, he accounted for Frenchman, Simon Gauzy, named at no.20 on the global order; Hwang Minha prevailed in six games (12-10, 7-11, 11-6, 7-11, 11-8, 11-7). Success for Hwang Minha, notably as the Men’s Singles third preliminary round progressed, there were also successes for colleagues Jeong Sangeun, Jang Woojin and Park Ganghyeon. A clean sweep of titles earlier this year on home soil at the Seamaster 2018 ITTF World Tour Korea Open, Jang Woojin emerged successful by the very narrowest of margins; eventually he overcame England’s Paul Drinkhall (9-11, 11-3, 12-10, 11-7, 6-11, 6-11, 11-9). Similarly, Park Gangyheon, who last month secured the Men’s Singles title at the ITTF Challenge Belgium Open booked his preliminary fourth round place, he overcame Germany’s Benedikt Duda (11-13, 11-6, 11-6, 11-1, 11-8). Meanwhile, not to be overshadowed, Jeong Sangeun ended the hopes of Slovenia’s Darko Jorgic (11-6, 14-12, 12-10, 6-11, 10-12, 3-11, 11-7). However for Jeoung Youngsik, Lim Jonghoon and Cho Seungmin, there were notable defeats. Jeoung Youngsik was beaten by Italy’s Niagol Stoyanov in a tension packed seven games duel (8-11, 11-7, 3-11, 11-7, 4-11, 11-8, 14-12), Lim Jonghoon lost to Russia’s Alexander Shibaev (11-8, 11-13, 11-6, 8-11, 11-3, 10-12, 11-4). Similarly, Cho Seungmin experienced a reversal of fortunes. Last week in Stockholm, he had beaten Japan’s Koyo Kanamitsu in the final of the Under 21 Men’s Singles event, in Linz the decision was reversed; Koyo Kanamitsu prevailed in six games (11-7, 11-8, 8-11, 9-11, 18-16, 11-4). Fine performance that caught the eye as the third preliminary round concluded; likewise Chinese Taipei’s Chen Chien-An and Lin Yun-Ju attracted the attention but for different reasons. Chen Chien-An experienced a surprise defeat at the hands of Belgium’s Cédric Nuytinck (11-8, 11-9, 5-11, 6-11, 12-10, 14-10). Conversely, Lin Yu-Ju beat Croatia’s Andrej Gacina by the very narrowest of decisions (11-5, 8-11, 8-11, 8-11, 11-5, 11-7, 14-12). 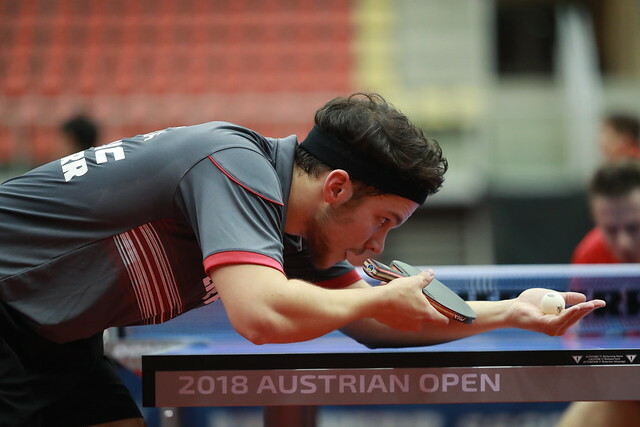 Defeats for leading names as the lower half of the draw concluded but for one name of note there was success; Germany’s Ruwen Filus ended the hopes of Spain’s Diogo Carvalho (11-6, 11-8, 11-9, 11-9). Play in the fourth preliminary round of the Men’s Singles event will be conducted later in the day.